Today, the Dallas County Commissioners will meet to discuss on possibly adopting an contract with Securus Technologies that would eliminate in person visitation. Over the past week, as word spread in Dallas County, so has opposition to the contract as hundreds of families contacted the commissioners to register their concerns with losing contact visits and monetizing communication between families. 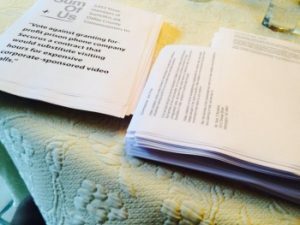 Texas CURE member, Josh Graven, along with several prisoner families will deliver a signed petition with over 2500 names of those opposed to adopting video calls in place of face-to-face contact. User of the proposed system would pay $10 for 20-minute session creating a hefty profit for the Securus and the county to pocket. The contract’s wording seems to suggest that face-to-face visits could be banned. In other sites where Securus has installed with system visitation hours have been canceled or reduced. The cost to prison families for the call is a sort regressive tax on the poor and the families, many with children, who seek to maintain contact with their loved one. Take action and send the commissioners a message and join the conversation on Twitter at #phonejustice.